A classic WWII survivor story based on award-winning author Johanna Reiss’s own childhood during the Holocaust. Now with a beautiful new cover and revised author’s note. When the German army occupied Holland in 1940, Annie was only eight years old. Because she was Jewish, the occupation put her in grave danger. Most people thought the war wouldn’t last long, but Annie knew that if she wanted to stay alive, she would have to go into hiding. Fortunately, a Gentile family, the Oostervelds, offered refuge to Annie and her older sister, Sini. For two years they hid in the cramped upstairs room of the Oostervelds’s remote farmhouse. There, Annie and Sini would struggle to hold on to hope—separated from their family and confined to one tiny room—as a frightful and seemingly endless war raged on outside their window. This classic autobiographical novel is a strong choice for classroom sharing and independent reading. Johanna Reiss was born and brought up in Holland. After she was graduated from college, she taught elementary school for several years before coming to the United States to live. 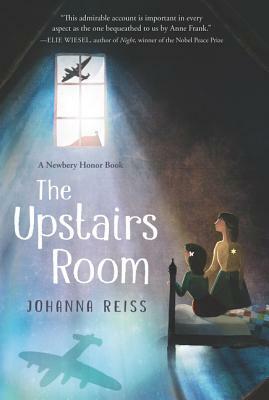 Her first book for children, The Upstairs Room, was a Newbery Honor Book, an American Library Association Notable Children's Book, and a Jane Addams Peace Association Honor Book, and it won the Jewish Book Council Juvenile Book Award and the Buxtehuder Bulle, a prestigious German children's book award.Mrs. Reiss writes that soon after she had finished Tie Upstairs Room, she found "there was still something I wanted to say, something that was as meaningful to me as the story I had told in the first book, the story of a war. `The fighting has stopped'; `Peace treaty signed,' newspapers announce at the conclusion of every war. From a political point of view, the war is over, but in another sense it has not really ended. People are fragile. They are strong, too, but wars leave emotional scars that take a long time to heal, generations perhaps. I know this to be true of myself, and of others. And out of those feelings came The Journey Back, a story of the aftermath of the Second World War. "Though Mrs. Reiss lives with her daughters in New York City, they make frequent visits to Holland to visit Mrs. Reiss's sisters, Rachel and Sini, and Johan and Dientje Oosterveld.